Galeria Leme is pleased to present Sebastiaan Bremer’s first solo exhibition Sao Paulo. The title of the show Invasões Holandesas is the Brazilian moniker for the Dutch period of rule in the 17th Century. Being Dutch and married to a Brazilian, this is a time in the country’s history which has both personal and artistic significance for Bremer. Through the encounter of the drawn and the photographic, Bremer presents a world that communicates a sense of experience of memory and the present and creates a layered reality which in all its confusion is a reflection of Brazil, and the artists’ response to it. Each piece of work for Invasões Holandesas started with Bremer’s initial fascination with early Dutch Court painters such as Albert Eckhout and Frans Post. These artists’ paintings are some of the earliest known images of the “new world” made in situ by Europeans and depict Brazil’s complex diversity, apparent even at that time. This fascination coincided with a chance find of 1930’s glass plate negatives of photographs of Brazil from old library archives in the USA. 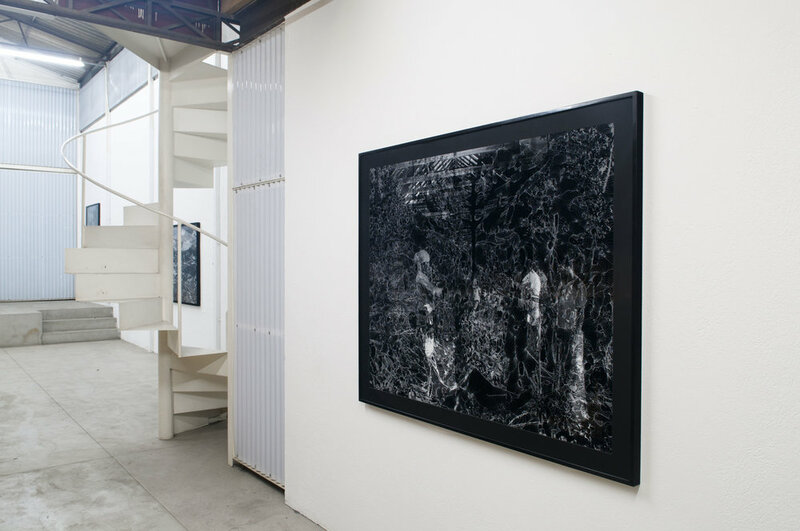 Once Bremer has found, redeveloped and printed his chosen images to size, he starts to draw intricate webs of small dots with white retouching paint over the photographic surface. Paradoxically this process obscures sections of the original image whilst redefining other parts, adding a new content to each piece. These ethereal drawings change the once familiar image into something more opaque, each thread spreading organically over the surface like the mycelia of a fungal growth creating a sense of decay. The visceral quality of the work lies in its inventiveness and technical complexity, whilst the compositions created by Bremer have a fine balance between the intricate and bold. Thin washes of colored India ink are occasionally applied by Bremer creating imagery reminiscent to the colors you see when you close your eyes. Invasões Holandesas no Rio de Janeiro (2010) comprises of three superimposed images of Rio de Janeiro taken in the 1930’s. These old US library archive images of the city are overlayed and printed by Bremer and the surface is covered with ghostly pastoral scenes appropriated from the old Dutch Court paintings. It’s a work where history and reality verses a dreamscape of lost ideals. The turmoil and chaos of the city is also apparent in this work, but the city in the photographs does not exist anymore, it has been knocked down and rebuilt since. The same is true for the colors, the dyes used to hand tint the original photos were used by Bremer giving an overall feeling of nostalgia. Sebastiaan Bremer was born in Amsterdam (1970) and moved to New York in 1992. His work is part of several important collections including the Victoria and Albert Museum, London, the Museum of Modern Art, NY, Los Angeles County Museum of Art, The Zabludowicz Trust, London, the Rabobank Collection, the AKZO Nobel collection, the Netherlands and Lodeveans Contemporary LLP, London. Bremer’s art work has been exhibited at the Tate Modern, the Brooklyn Museum of Art, The Aldrich Museum, Connecticut, PS1/MoMA, New York and Het Gemeentemuseum, The Hague. He has recently shown at Barbara Thumm, Berlin (May 2009), Hales Gallery, London (October 2009), James Fuentes LLC in Chinatown, NY (June 2009), Bravin Lee Programs (September 2009) and in 2008 completed a large commission for the Los Angeles County Museum of Art, in which he referenced LACMA’s collection of Dutch Masters’ paintings. He is currently working on a mural in KaDE Kunsthal, Amersfoort.